Google Doodle today marks the 103rd birth anniversary of the German glass chemist and scientist Marga Faulstich. Google Doodle today marks the 103rd birth anniversary of the German glass Chemist Marga Faulstich. Marga Faulstich was born in Weimar in 1915. She did her training as a graduate assistant at Schott AG, a leading manufacturer of optical lenses and special techniques in Europe. The results of her first few research works were fundamental at that time and are still used in the manufacture of sunglasses, anti-reflective glasses, and glass facades. Faulstich’s progression in her career was quite fast, from a graduate assistant to a technician, to a scientific assistant and finally to a scientist. Her fiancé had died during the World War II, and from that moment she decided to focus solely on her career. The situation caused some trouble in her career though. 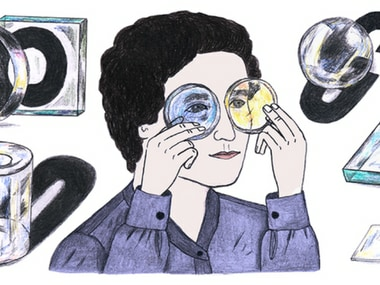 Marga Faulstich later worked on the research and development of new optical glasses, with a particular focus on the microscope and binocular lenses. In addition to her research, Faulstich achieved a melting pot. Marga Faulstich received international recognition for the invention of the light SF 64 lens. She was honored in 1973 for the same. After retiring from Schott after 44 years in 1979, she spent the next few years traveling to distant countries. Faulstich gave lectures and presentations at several glass conferences, until she died at the age of 92, in the year 1998.